Democrats, now the majority in the House of Representatives, are trying to turn that body into the House of Resistance. They vowed to use the State of the Union to voice their claims that the nation is in bad shape, rigged to benefit only the rich. But facts are stubborn things. Fact No. 1: An amazing 304,000 jobs were created in January, according to Labor Department data, up from an average monthly gain of 223,000 in 2018 and 182,000 in 2017. A steady upward march. Too bad President Donald Trump couldn't invite all the new hires to attend his speech to show off the impact of Trumponomics on real people who have to put food on the table and make mortgage payments. Fact No. 2: Even those who had given up hope of finding a job are re-entering the labor force. Employers are dropping requirements like college and prior experience. The labor participation rate for workers age 24 to 54 just hit its highest level since 2008. January's job gains outstripped predictions. Many economists conclude this steep upward trend should put an end to fears of a recession in 2019, despite a slowdown in other parts of the world. Americans are taking home more pay, and that means they can spend more. It's consumer spending that drives two-thirds of the economy. Fact No. 3: Wages rose 3.2 percent over the last 12 months, the best yearly increase in a decade. What's not to like? Yet Democratic pols would rather whine than deal with reality. 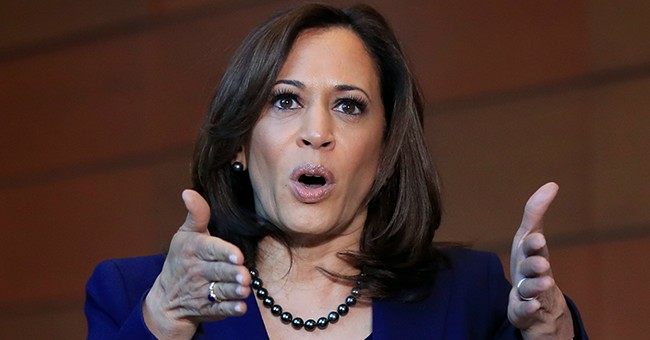 Presidential hopeful Sen. Kamala Harris, D-Calif., rants that "the economy is not working for working people." Huh? Sen. Cory Booker, who made his run for the White House official last week, claims the nation needs to change course so "parents can put food on the table" and "no one is left behind." Dems won't admit the inconvenient truth that the economic boom is benefitting working people. We're in an increasingly worker-friendly environment. In January 2017, just before Trump took the oath of office, number crunchers at the Congressional Budget Office predicted a measly 94,000 jobs per month would be created in 2018. The actual gains were more than double that. What explains that change? Trump's tax cuts and broad scale deregulation. Now the CBO number crunchers are forecasting strong competition for workers and rising wages throughout 2019. That's lousy news for Democratic politicians trying to sell a massive, taxpayer-funded federal jobs program called the Green New Deal. It's being aggressively promoted by Rep. Alexandria Ocasio-Cortez, D-N.Y., and almost all the Dems running for president. In addition to pushing eco-boondoggles, the Green New Deal would make Uncle Sam the employer of last resort to guarantee "living wage" jobs and eradicate poverty, according to a draft circulating around Congress. Earth to Democrats. Jobs aren't scarce; workers are. Admittedly, there are millions of working-age people watching TV, playing video games and subsisting on food stamps. The participation of working-age men in the workforce is lower in the U.S. than in almost any other developed country. That's tragic. What's the remedy? Welfare reform, plus skills training. Food stamps should be for people willing to work who need help making ends meet. But three-quarters of able-bodied working-age food stamp recipients without children to care for still don't work, even part time. A work requirement would incentivize the slackers to get off the couch. Yet Democrats adamantly oppose it. They'd rather guarantee everyone a paycheck. What an insult to hard workers. Dems brag they'll raise the federal minimum wage to $15. Beware. In many states and cities that hiked their local minimum wages, including New York, consumers are paying more for Uber rides, French fries and lunches out. Worse, the workers these Democrats claim to be helping are losing out. Businesses are cutting hours and eliminating jobs. Instead of a hostess at the front of the restaurant, there's a sign that says to "please seat yourself." Fast-food restaurants are replacing cashiers with automated kiosks. Ask yourself what's more worker-friendly: Trump's booming economy or the Democrats' misguided meddling?